When reactions grab you by the throat, these tools instantly redirect your reactive destructive thinking into a self-empowering response . With practice will be able to reverse all anger/fear based reactions. You will begin by dissolving your current misperceptions, upsets and disappointments. Constructing an impenetrable internal resolve will allow you to rediscover the love in innocence we were all born with. Re-connect with your innate nature of being love over fear. 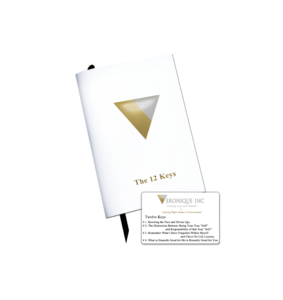 Unproductive responses quickly lose their hold, allowing your well-being and prosperity to flourish.The 12 Keys transform. They are not something to just read once and forget about. Their purpose is to provide a subconscious change and a conscious focus into increasing freedom, happiness and prosperity when you unconditionally use them.The Keys address limiting beliefs on the subconscious level from what has held you back from effortlessly expanding and flourishing in life. When using the Keys to defuse destructive responses, you empower your mind to move quickly beyond what destroys happiness, health, and wealth into an elevated constructive awareness that leads to a free way ‘to be’. With these KEYS as an unconditional guide you build upon knowing instinctively how your goals and aspirations are more easily achieved. These Keys provide you instant and powerful tools to transform limiting and highly reactive and destructive responses to your experiences into supporting you in a simple HOW you are able to realize an unlimited reality- NO MATTER YOUR CURRENT CIRCUMSTANCES. Get Your Download Copy – Pre Order Your Copy Today! Get Your Hard Copy – Pre Order Your Copy Today!